On your next summer picnic, pack up this colorful high-protein salad. 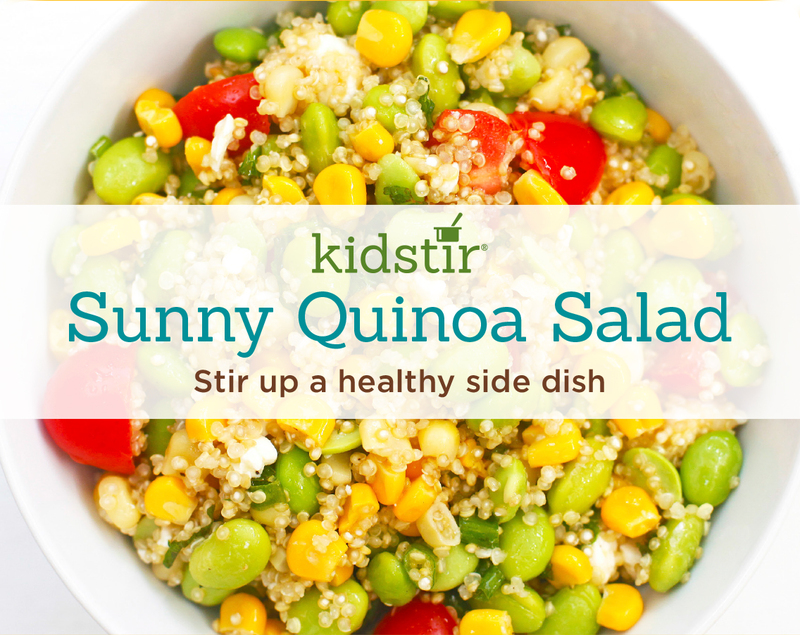 It's made with quinoa, edamame, corn, and other veggies (we bought frozen corn and frozen shelled edamame to make things simple). The kids will eat it up! 1. A grown-up can help cook the quinoa. In a large pot of 2 cups water, cook 1 cup quinoa according to package instructions. 2. In a large bowl, mix the cooked quinoa, edamame, corn, chopped scallions, diced tomatoes, chopped mint, and crumbled feta. 3. In a small bowl, make the salad dressing. Whisk the olive oil, lemon juice, crushed garlic, salt, and pepper. 4. Pour the dressing on top of the salad and gently toss. Add more salt, pepper, lemon, olive oil, or mint to taste. Eat right away, or refrigerate for up to 2 days.